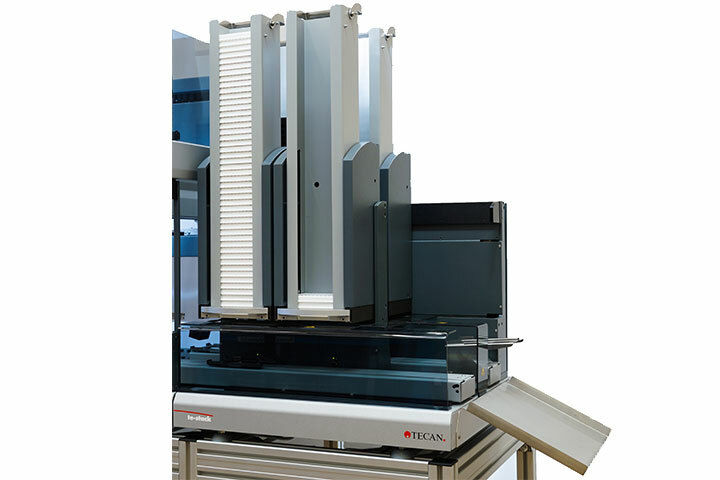 The Te-Stack module gives laboratories an efficient and affordable way to automate the storage, retrieval and delivery of microplates and disposable tips, for unprecedented process throughput in a wide range of genomics, proteomics, and drug discovery applications. It handles microplates, deep-well plates, PCR plates, etc. and accommodates a range of disposable tips. The Karlsruhe Institute of Technology has automated protocols for high throughput separation of cells for therapeutic applications on a Freedom EVO® 200 liquid handling platform. The process maintains cell viability and is more rapid and reproducible than manual methods, enabling processing of 96 samples in four hours. Global biopharma company UCB has increased the throughput of its antibody purification pipeline, using a flexible Freedom EVO® workstation to miniaturize its chromatography applications. As a result, the Company is able to investigate far more parameters in a fraction of the time, while consuming significantly less material.